For discharging contents at heights ranging from approximately 1.5 metres up to 15 metres. Maximum of 180 degree angle of discharge available and loads from 25 Kg up to 2 tonnes handled (depending upon model required). 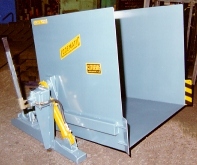 Primarily used to assist Operators in the loading/off loading of parts from containers. Up to 60º angle available and maximum gross weight of up to 2,000 Kg. Control options include hand/foot pump, valve lever or push button. These machines can be plinth mounted or situated on rising platforms to maintain constant working height.